One of the pioneers of the pink gin sub-category, Pinkster, has invested a six-figure sum in order to refresh its packaging and unveil a creative campaign entitled ‘The Dos and Don’ts of pink gin’. Launched in 2013, Pinkster has refreshed its packaging in order to stress that the coloured gin category should be about flavour rather than Instagram appeal. Shortening its tagline to ‘made with real raspberries’, the new packaging is being rolled out across the entire range on its 70cl, 35cl and 5cl bottles. Co-founder, Will Holt, remains upbeat about growth in the pink gin sector. “I believe it’s a positive thing for pink gin,” he told db. “I think this recent investment has established pink gin as a proper sub-category when it wasn’t before. It now has financial muscle behind it. 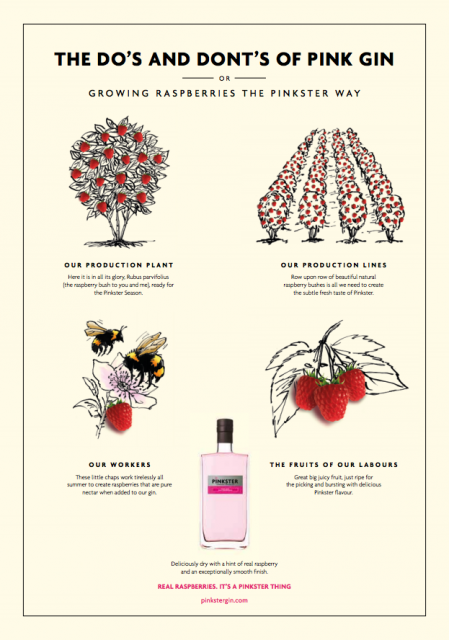 Now there’s desire from the on-trade to have a pink gin in their portfolio”. Speaking about the latest developments for the brand, he added: “Real raspberries are our USP and this is now reflected more vigorously through both our packaging and advertising. “We’ve long encouraged people to focus on the flavour and the colour. Drink pink because it tastes good, not just because it looks Instagrammable in the glass”. It has been a busy year for Pinkster which has seen the launch of the third “and final” product created using the leftover fruit from its distillation process – Pinkster Royale – as well a 3-litre bag-in-box format of its gin priced at £135 and targeted at the events market. The pink gin category as a whole has seen explosive growth in recent months, some time after the likes of Pinkster and Edgerton were launched in 2013 and 2011 respectively. Among those that have recently gone pink are Gordon’s in September 2017, Beefeater Pink in February 2018, Bacardi’s Bosford Rose in July and Italian liqueur giant Luxardo in August. Others to have launched in recent months include Bloom Pink, JJ Whitley Violet, Malfy pink grapefruit and rhubarb, Adelaide Hills sunset gin, Hoxton Pink, Old Curiosity Rose, Gin Kitchen Blushing Monkey, Collagin Rose, Adnams Copper House Pink, Asda’s pink gin range, Pickering’s Gin’s pink grapefruit liqueur and King of Soho’s pink Variorum Gin.